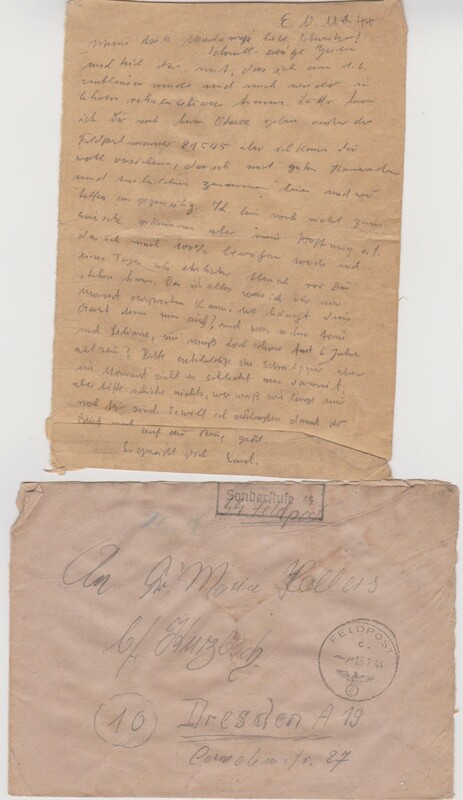 Letter from SS-Sturmmann Ernst Buchhorn to his sister Maria in Dresden, dated July 11, 1944. Buchhorn states that he had been released on June 1 for rehabilitation. Sonderkommando Dirlewanger records indicate that on that date some 287 political prisoners were released from the Sachsenhausen concentration camp for service with the unit, while 182 German political prisoners were released for the same purpose from Auschwitz. Buchhorn undoubtedly had been incarcerated and came from one of these two locations. Just a few quick words and I can tell you that I was released on June 1st and that I have been given the chance that I can restore my honor and will be rehabilitated. I am not allowed to tell you where I am at present, but my Feldpost Number is 21545, and I can assure you that I am in the company of some good comrades and trainers and together we are poised to help each other a lot. I am not yet deployed to action, but my hope is that after a 100% rehabilitation, I can one day come back to you as an honest person. That is all I can promise you for now. Now, where is your Albert these days? How are the children Toni and Liliane; she must be almost 6 years old by now? Please excuse the writing paper but right now I had nothing else. Please do not send anything because we do not know how long we will stay here. And so I will close and the letter can go out in the mail.